As any good realtor would tell you, this is a listing you really have to see for yourself. 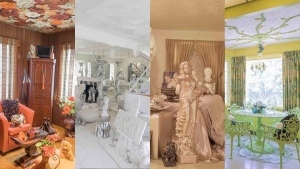 Truly, words can’t do justice to the sheer number of statues, busts, knick knacks, flowers, stuffed animals, miniature cars, crocheted ceilings and stuff, for lack of a better word, in a Detroit real estate listing that has the realtor swamped with calls. 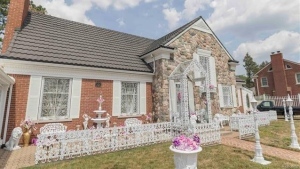 The home, dubbed Lions Gate Estate, is being sold along with all its contents at a starting price of US$550,000 – cash only – in an otherwise miserable Detroit housing market. But it’s the little touches (and there are a lot of them) that really set the three-bedroom, 1,886-square-foot Lions Gate Estate listing apart from the rest. “Unique barely begins to describe this one-of-a-kind Grixdale Farms estate,” Real Estate One agent Alex Lauer writes in the online listing. For instance, the living room isn’t just a living room. It looks like a stereotypical depiction of heaven, with absolutely everything in the room coloured white or silver. It even comes with an all-white baby grand player piano in the room, which the listing says was designed by Kohler & Campbell. That baby grand piano is one of the most valuable items included in the listing, along with a 1966 Cadillac Fleetwood Sedan and a 1974 Lincoln Mark IV Coupe. Both cars are described as “one-of-a-kind, custom-built” by the seller, who previously worked as a designer in the automotive industry. Lauer told CTVNews.ca that the Cadillac’s custom features include a phone and running water. The custom garage where the cars are housed is just one of many themed rooms in the home. Some rooms have crocheted ceilings. Others have faux-mink walls and ceilings. One room is wood-panelled, with a shag carpet and kitschy artwork everywhere. Another room features a crystal Lucite dining table set, which comes with two eccentric-looking elf dolls. Statues, stuffed animals, dolls, figurines and other lifelike figures occupy most of the rooms, so prospective buyers need never worry that they’ll be alone. Turn your head in the house and you’ll probably see a carved face turned to look at you. The bedrooms are also sights to behold. Each one comes with a single bed, draped in what appears to be velvet sheets and flanked at the foot of the bed by Grecian statues. One bed is draped in a black blanket, and comes with a matching pair of slippers and a stuffed black dog. The blanket, slippers and dog all appear to be made from the same material. The home also includes two full bathrooms and two half-bathrooms, each done up in a “mind-blowing” different theme. One features classic statues in a white, silver, cream and black colour scheme. Another bathroom looks like a colour bomb exploded inside it, with green, purple and blue flower-patterned wallpaper absolutely everywhere. “The whole thing is a giant composition, essentially,” Lauer said. The home’s owner, Ronald Nassar, is still very much alive, and is eager to see his meticulously designed home sold to someone who will appreciate it. The 67-year-old retired industrial designer transformed the property into what it is today after inheriting it from his parents, who passed away decades ago. Since then, Nassar has endeavoured to give each room a theme and a colour scheme, and has outfitted the house from top to bottom with modern features. Prospective buyers are being asked to provide 48 hours’ notice before a viewing, and are also required to prove that they have the half a million dollars necessary to buy the home before they are approved for a tour. The listing also stipulates that any showing must be done on a sunny day. But that’s just scratching the surface of everything in the home, Lauer says. “Whoever ends up buying it is going to find some surprises,” he said. The 1,886 square-foot home also includes a heated outdoor pool. The home is at 450 Grixdale Ave. W., to the east of Detroit’s main north-south highway, Woodward Avenue. Lauer says the home would have been worth twice its listing value if it were on the other side of Woodward, but as it is, he predicts the property will be a good investment going forward. 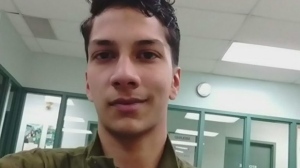 Mark Druckmiller, a referring agent at Real Estate One’s customer care centre, described the listing as “a bit of an anomaly” for the Detroit area, given that nearby properties are listed at $138,000, $60,000 and $27,000. One bulldozer-ready house nearby is even listed at $5,499. Druckmiller added that it’s extremely rare to see a seller ask for cash only, with no financial options available. He adds that the house itself is truly one-of-a-kind. IN PICTURES Unique barely begins to describe this one of a kind Grixdale Farms estate in Michigan.